Connect MailChimp with Event Espresso, so your attendees are sent to a MailChimp list after a successful registration for your events. Afterward, you can keep attendees updated by sending information about future events or even invite attendees to register for upcoming events. The old documentation for Event Espresso 3 is available here. Need to buy a support license for the EE4 MailChimp integration? 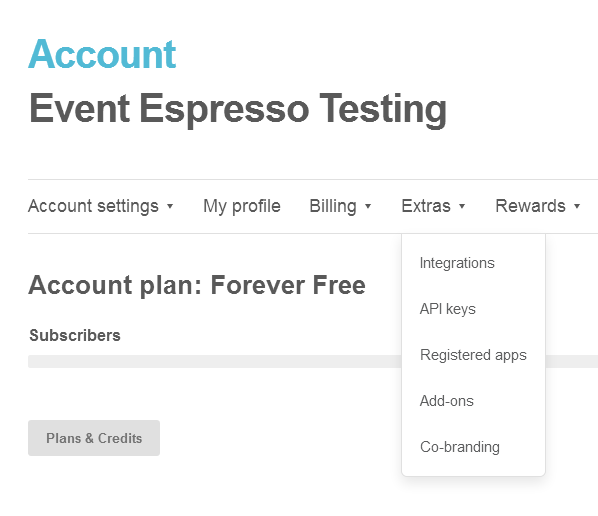 Download the latest version of the MailChimp integration for Event Espresso 4 from your Event Espresso account. 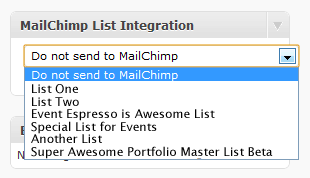 From your WP dashboard, go to Event Espresso —> MailChimp Settings. 1. If you do not already have an API Key for MailChimp, then one will need to be created. First, log in to your MailChimp.com account. Then go to your Account dashboard and locate Extras –> API Keys. 2. Click the Create a Key button and a MailChimp API Key will be created for you. Now copy the entire API Key. 3. Then login to your WP dashboard and go to Event Espresso –> Add-ons –> MailChimp. Then paste the API Key into the field and click on Save. 4. MailChimp API Options – There is an option as shown in the screenshot above to skip the double opt-in emails. By default, the option is unchecked (disabled). If it is enabled, then Event Espresso will immediately add an attendee/registrant to a specific list in MailChimp, and they will not need to confirm via email. 5. Submit to MailChimp when – select your preferred option for when attendees/registrant should be added to a specific list on MailChimp. The default option to add when a registration is completed with an approved status. Other options include registration is completed (payment status does not matter) and subscribed submits information. Now when you are creating or editing an event, you will have a MailChimp List box. 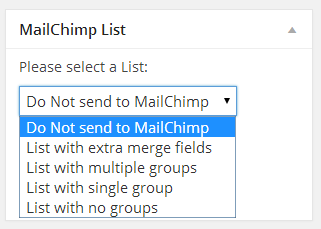 This drop-down menu allows you to specify which MailChimp mailing list to add the attendees too. The list must already exist, so if you want to have each event have a separate list, you will first need to create the lists in MailChimp. Event Espresso 4 will pass the attendee’s first name, last name, and their email address to MailChimp. 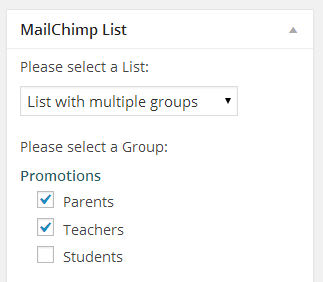 You can also set up the groups within the lists in your MailChimp account. Once groups are set up within a list, you select that list in the Event editor in the MailChimp List integration box. Once a list that has groups is selected a new select box will appear below that will let you select a group. When you initially create your event, all of the question dropdowns will display ‘none’, this is because no questions are assigned to your event until it has been created. Once you save the event (either publish or save as draft) all of the questions from within your assigned question groups will be available to select in the dropdowns. Please double-check your API Key that is entered into the MailChimp settings page within your WordPress dashboard. Ensure that no extra spacing appears before or after the API Key. Our support team cannot write custom coding for you. Below are some examples on customizing this integration. See more customizations in the code snippets library for Event Espresso. Need to buy a support license for the EE3 MailChimp integration? This integration requires Event Espresso 3.1.33 or newer. It cannot be used with old versions of Event Espresso 3. Download the latest version of the MailChimp integration for Event Espresso 3 from your Event Espresso account. 1. If you do not already have an API Key for MailChimp, then one will need to be created. First, login to your MailChimp.com account. Then go to your Account dashboard and locate Extras –> API Keys. 3. Then login to your WP dashboard and go to Event Espresso –> MailChimp Integration. Then paste the API Key into the field and click on Save MailChimp API Key. 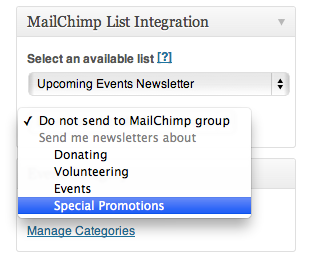 Now when you are creating or editing an event, you will have a MailChimp List integration box. 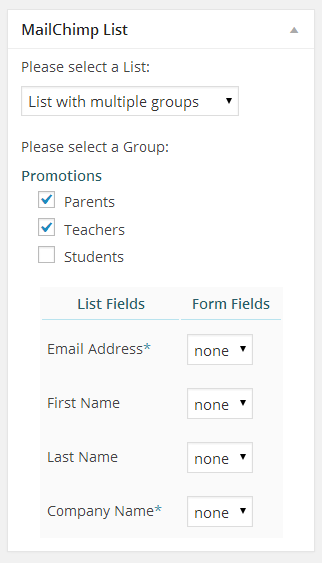 This dropdown menu (example shown above) allows you to specify which MailChimp mailing list to add the attendees to. The list must already exist, so if you want to have each event have a separate list, you will first need to create the lists in MailChimp. Event Espresso 3 will pass the attendee’s first name, last name, and their email address to MailChimp.